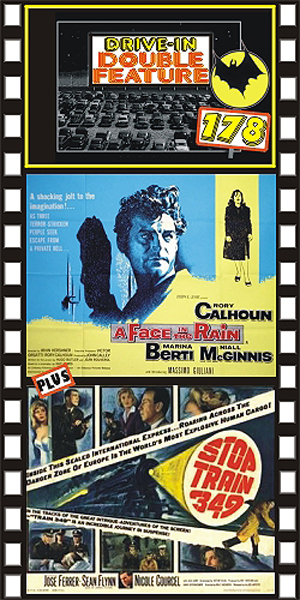 FACE IN THE RAIN (1963) Rory Calhoun, Marina Berti, Massimo Giuliani, Niall MacGinnis. Calhoun plays a tough American spy on the run in Nazi-occupied Italy. He dodges sadistic SS troops and pro-Nazi Italians before holing up in the house of a beautiful Italian lady (Berti) and her son (Giuliani). It’s a bit complicated though because Berti is in a forced romantic relationship with a German officer who just happens to be in charge of the unit trying to track Calhoun down! This is a well-made, often tense spy drama that we believe is on DVD for the first time. From 16mm. STOP TRAIN 349 (1963) Sean Flynn, Jose Ferrer, Nicole Courcel. A marvelous film about an American Army train going from Berlin into the West Zone. On board is an East German stowaway. The Russians get wind of it and stop the train. A tense, nail-biting standoff between Yanks and Reds ensues. An engaging script holds your interest. Errol Flynn's son, Sean, showed real potential in this vastly unappreciated film. 16mm.